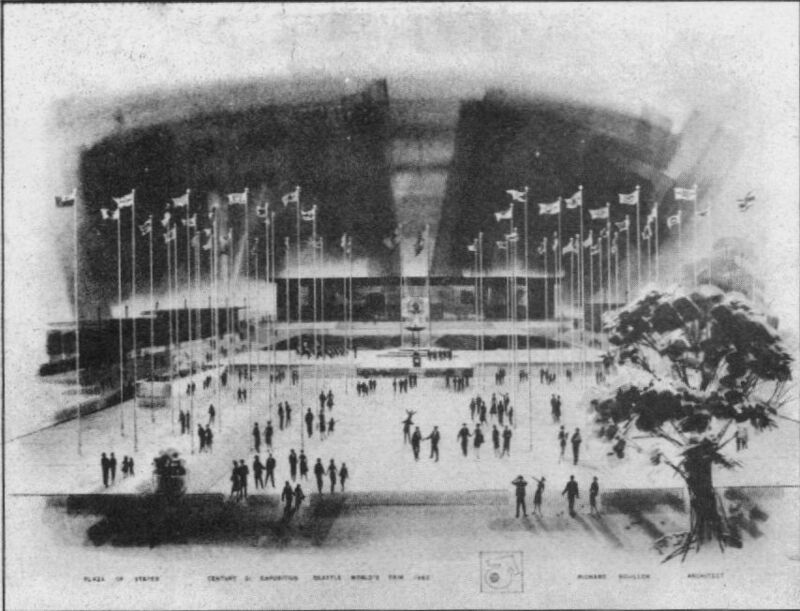 A "living" exhibit created by the World's Fair Commission from funds voted by the Legislature is the Plaza of the States ... A ceremonial area located in the heart of the Fairgrounds, the Plaza will be the site for special programs honoring the Fifty States of the Union . . . created at the specific request of Governor Albert D. Rosellini, the project tells graphically the story of America from the time it began as the thirteen original colonies and traces its history to the status of the United States today . . . Victor Rosellini is Chairman of the Plaza Subcommittee for the Commission ... his Committee includes: Senator Reuben A. Knoblauch, Representative Ray Olsen, Representative Leonard A. Sawyer and Paul S. Friedlander . . . Richard Boullion designed the Plaza based on the Honor State Day program originated by Jack Gordon who serves as program coordinator. Guy Williams produced the script. The fifty flags of the States will range the periphery of the Plaza in the order of their admission to the Union. On the stage a huge gas-fed flame font—symbolic of the unity of the States—will burn throughout the 183 days of the Fair. The United States Flag and the Washington State Flag will flank a huge gold reproduction of the State Seal of Washington—honoring the State's namesake and the Nation's first president, George Washington. 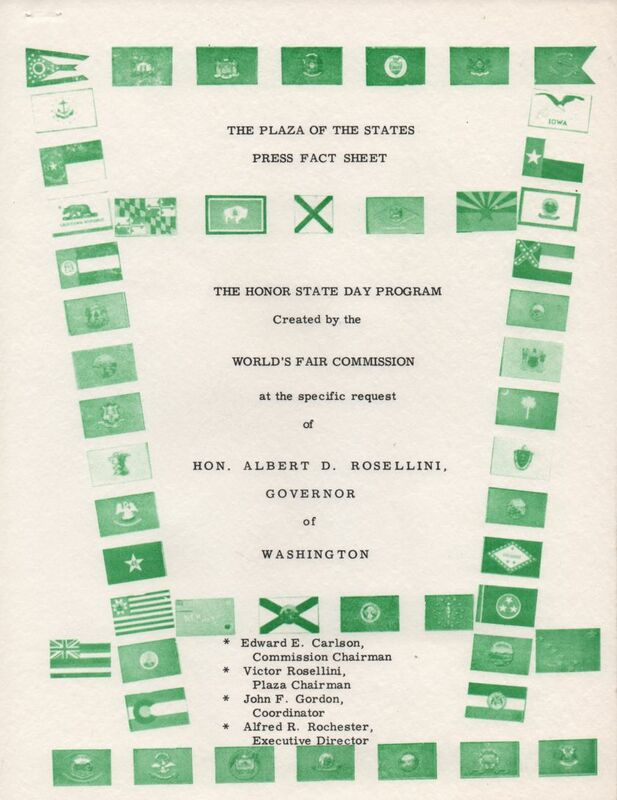 On honor State Days, the flag of the honored state will fly in place of the Washington State Flag. The latter will be flown on its own pole with the other state emblems. At the base of each flag-pole will be a marker detailing information about each state including its admission date to the Union, its population, its capital city, its size, its trees, flowers, birds and products, and its motto—all designed to make history come alive again for old and young as they visit the area. The Plaza will be brilliantly lighted at night. The Governors of the respective states will lead their state delegations to the Fair on the special days. A map of each state will display historical figures and sites and each state's seal will be set in the plaque. "The United States themselves are essentially the greatest poem . . . Here at last is something in the doings of man that corresponds with the broadcast doings of the day and the night."